Hearty weeknight meal for the whole family. Skillet sausage pesto pizza dip with pork sausage, bell peppers, onion, kalamata olives and mushrooms. Cream cheese added to make it saucy. It’s like a combo pesto pizza as a dip! Within this recipe post you’ll make a simple pizza dip that’s a real treat for the family as a weeknight dinner. Plus you’ll learn about skillets and taking proper care of them. A puff of white powder billows up as flour cascades into a large bowl. My mom looks over at me and smiles, seeing my face light up. “Are you ready to get your hands dirty?” she asks. I excitedly dive in to make the crust for my first homemade pizza. I was about 5 at the time and things like swimming, dinosaurs and of course food (especially cookies) were big deals for me. Childhood moments like these are the cherished beginnings of my love for food, and what’s ultimately led me to follow my passion; to learn food photography and run a recipe blog. Cooking was an important part of my family; growing closer over laughs and stories as we ate together at the table, enjoying family favorite comfort foods. I grew up in a family of five siblings and my mom would always cook hearty homemade meals. I’d help whenever I could and have loved food ever since. I’ve been sharing more comfort food lately as that is what’s closest to home for me. You may have noticed the subtle change in my blog’s logo tagline, which sums it up perfectly. This Sausage Pesto Pizza Dip is a modern spin on classic pizza, and perfect as a weeknight dinner or fun party appetizer. A simple culmination of rich and flavorful ingredients that cooks into a creamy dip. It’s a pesto pizza, but without the crust! The main flavor for this recipe is Jimmy Dean Pork Sausage. It’s the perfect addition to any family meal, not just breakfast. Adding Jimmy Dean Sausage is a great way to spice up any weeknight meal into a bold dish. Be creative and add it to all sorts of your favorite family recipes. 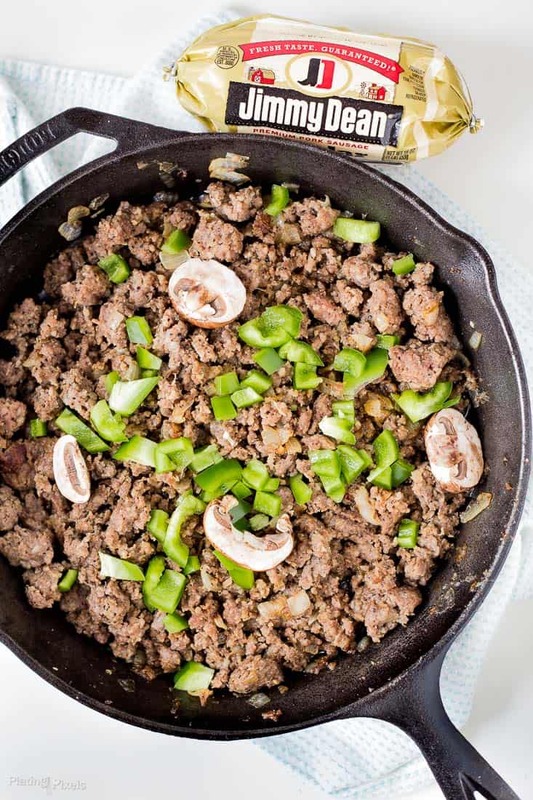 Start by cooking the Jimmy Dean Pork Sausage and onion in a skillet, then add in mushrooms and bell peppers. Drain and stir in remaining ingredients including pesto sauce, cream cheese, kalamata olives and mozzarella cheese. That’s a whole lot of flavor in one skillet. Bake it all together into a hearty melted dip. It’s just like eating a combo pizza with pesto sauce, and you can dip whatever you want in it. Skillets are a wonderful cooking utensil and with proper care it will last you forever; a skillet can often be kept within the family and handed down for generations. There are many different viewpoints on cleaning and maintenance; but here’s what I find works best: After cooking and allowing to cool, rinse under warm to hot water and scrub with a rough sponge; just water and no dish soap. If pieces are stuck, add water and bring to a boil to loosen. Once clean, place over a lightly warmed burner or in oven at a low temp until dry. Do not let air dry as it can rust. Then lightly grease (I use a bit of pork fat) and store. 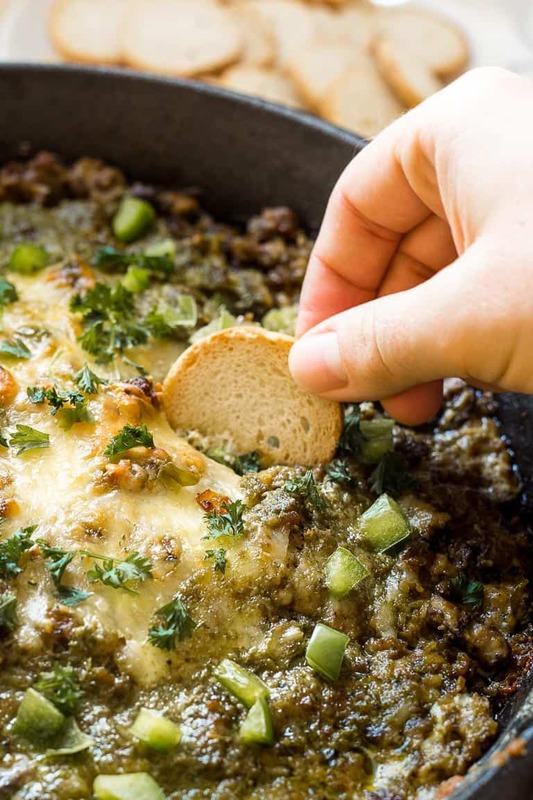 It's a sausage pesto pizza dip that's gluten free! Preheat oven to 400º F. Heat oil to medium-high heat in a large skillet. Add onion and cook 4–6 minutes, stirring often until softened. Stir in Jimmy Dean Sausage, salt and pepper. Cook 7–10 minutes more, breaking up meat as it cooks, until browned. Add bell pepper and mushrooms to pan, cook 5 minutes until softened. Remove from heat and stir in olives, pesto sauce, cream cheese and 2 cups mozzarella cheese. Sprinkle top with with remaining mozzarella. Bake 10-15 minutes until heated through and cheese is golden brown. Top with parsley and serve warm with toasted bread or bread crackers for dipping. Find my recipe plus more delicious Jimmy Dean Family Table recipes here. This dip looks INSANE! 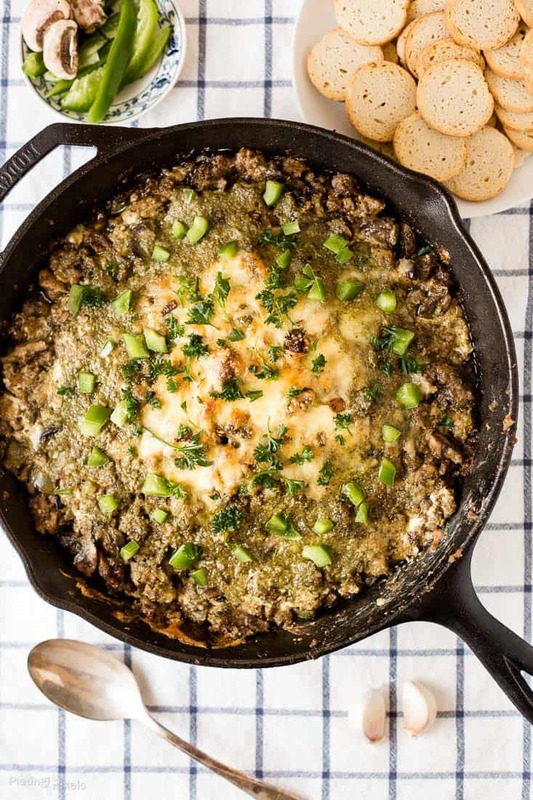 So many amazing flavors all in a skillet with cheese. A must make and must have…right now. This made me so hungry!!! It looks wonderful! This pizza dip looks incredible!!! My hubby and I are going to make this probably this weekend–thanks for the recipe! 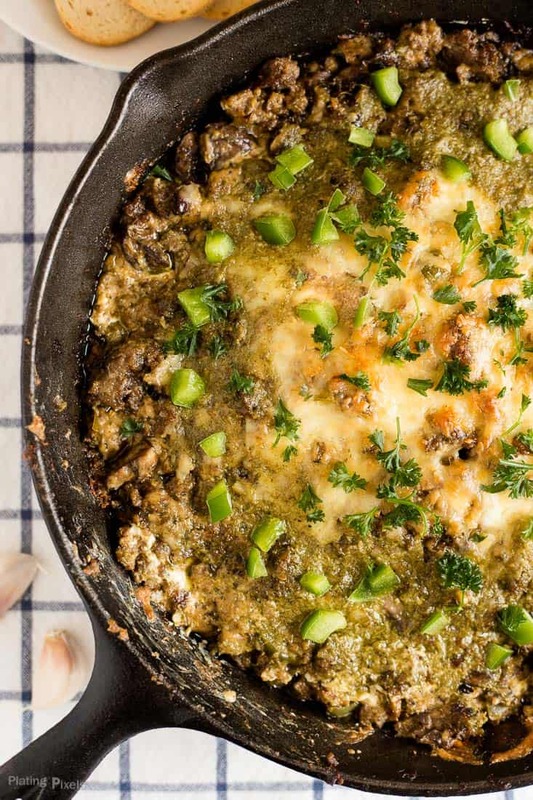 Looks fantastic, I have just bought a skillet so I will give this recipe a go. Thank you for sharing. Oh yummy! I think I could probably eat the whole skillet myself! Haha that’s a tempting idea. Thanks Victoria! Oh my goodness! I could sit and eat and eat and eat this! Looks so good! Pinning so I can try it! Foodie confession time: I don’t have a cast iron skillet. But you’re recipe just inspired me to get one. They cook much better than regular frying pans. Dip looks amazing btw. Thanks for sharing! The flavors in this dip sound amazing! This is an absolutely delicious idea! What a fun way to make and eat dip! This sounds amazing! I just added it to our menu for SuperBowl. That’s awesome! Thanks and enjoy Stephanie! Gotta love anything with sausage in it! I love the efficiency of this dish. All in one cooking implement and serving dish. Very imaginative. The dip looks inviting and perfect for those wintry days. Skillets and one-pots are perfect family meals. It totally is and thanks Mark! I love my cast iron skillet and use it all the time. What a tasty recipe! Glad to meet another cast iron skillet for life club member. Thanks Christine! Wow! I can’t believe this is a dip! I don’t eat any meats other than fish anymore, but I can remember enough to imagine how delicious this would be. Great photos, too! Thanks so much Dana! It totally is and thanks for stopping by!